Professional Artists and educators alike prefer professional level equipment to get the job done. Dave Buda is no exception to the rule. Dave chooses Bartolini as his go to for pickups and Electronics. A perfect match for his high expectations is the Pedulla Bass line. Mike Pedulla, a builder of the highest quality instruments, uses Bartolini almost exclusively for his high profile customers. Bartolini has many shapes and sizes of soapbar pickups to choose from. 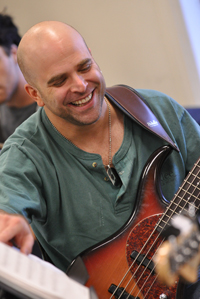 Berklee College of Music Bass Instructor and Professor David Buda has recorded and performed with a number of artist including: Patti Labelle PBS special “Patti Sings Gospel, Take Six and Aaron Nevelle PBS Christmas special, Mary Chapin Carpenter “A Night of Pops”, Martina McBride, Amy Grant, Vince Gill, PBS “Have Yourself a Merry Christmas” special, Kenwood Denard Trio, Thaddeus Hogarth, Best local act (Boston), Broadway first national tour of “Rent”, Appearances with John Williams and the Boston Pops, Appearances with Josh Grobin and Clay Aikin at Tanglewood, Played on LaPassione Album, Boston Modern Orchestra project, Played with bassists Steve Bailey, Rufus Reid, Member of locally (Boston) renowned Tigers Bakou, Boston Pops album “America”, Recorded “Super Bowl 02 theme”, and played on the Boston Pops Grammy nominated album “My Celtic Dream”. David’s Pedulla Instruments include: Buzz, Pentabuzz, MVP 5, Rapture RBJ2-5.